This year Dream Learn Work was invited to participate at the yearly educational event ´Educação 360´, organized by O Globo and Extra newspapers, in partnership with Sesc and the Rio de Janeiro’s government, with the support of TV Globo and Canal Futura. 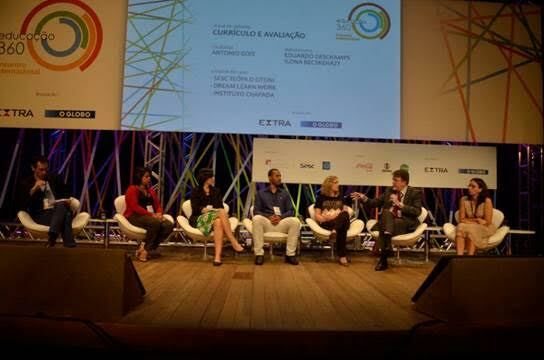 Our General Manager, Ana Luiza Carboni-Brito, participated in debates and presented our project at the event. ‘Educação 360’ is an international meeting with the participation of educators, teachers, school directors, students, families and representatives of the community. The aim is to share the largest possible number of visions and innovative and successful experiences that seek to meet the demands of society in relation to teaching and learning. Events like this are crucial for Dream Learn Work and our participant. In our day to day work we face challenges on changing a culture that does not inspire to choose education. Our participants have chosen to study and work hard to change their futures, and motivation is essential for them to complete their studies. After this event Dream Learn Work was featured in various articles in Brazilian media and on Educação 360 social media (see links below) underlining the importance of education.